Well, on the first "front"...ISBE representative, Sheryl Poggi, stood up before the assembled employees of CSD #1 in November 2002 and said that ISBE was looking at restructuring the District because of its low test scores. 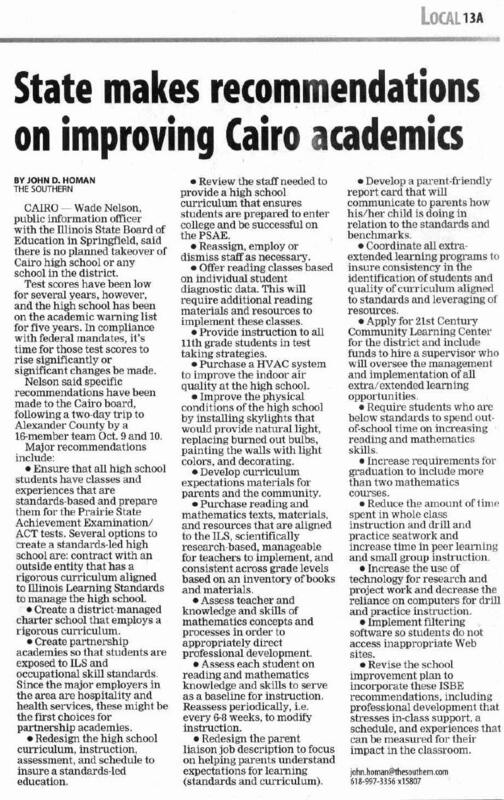 In fact, she said, if Cairo High School did not raise its test scores in the Spring, it would be first...restructured for the 2003-04 school year. Later, during "break out" sessions, Poggi was asked "Why CHS first...when CJHS was ahead of it in the "pecking order". Give Poggi credit for one thing...she didn't mince her words. Poggi informed high school personnel that the high school would be first because the Cairo Board of Education and the superintendent has asked that it be first...that that was "where the problems were"! (We have heard complaints from school board members for years about the make-up of the CAT bargaining team - 4 of 7 were from CHS, including the President and the Chief Negotiator.) Hmmmm...smells fishy to me! 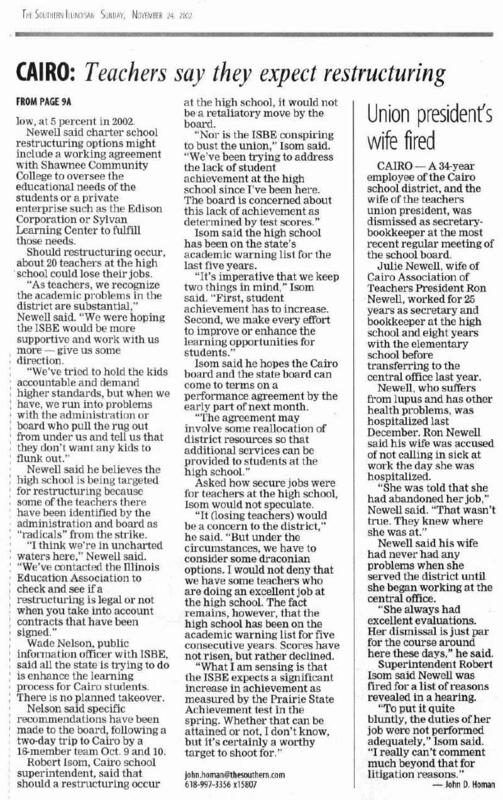 And, if that wasn't enough, in the same month, the Cairo Board of Education fired 34-year employee, Julie Newell...who just happened to be the wife of the CAT President, and an outspoken union advocate in her own right. Why? Well, according the District officials, Julie abandoned her job in December 2001. (She was suspended without pay in January 2002, even though she had produced written documentation that she had been hospitalized during the period in question.) After a 3-month "investigation", the Superintendent issued his findings/charges for dismissal...a total of 4 pages. Most of the charges involved "not paperclipping documents together" and "failing to date documents". (The District would have been better off to fire the person who prepared the exhibits of Julie's "crimes". When the exhibits were delivered to Julie's IEA attorney, the documents revealed "photocopies of paperclips" and "photocopies of whited-out dates"!) Hmmmm...are you getting the picture yet? So...as they say...even though you may be paranoid, it doesn't mean that somebody isn't really out to get you!